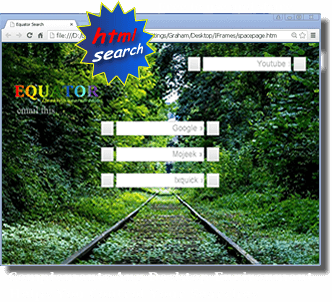 * Equator search is a standalone html/css webpage built to conveniently access multiple search engines. * The desktop shortcut delivers effective results from one location. * It should work in most browsers with new links and features being added all the time. The Equator Search Page was designed to conveniently access popular search engines. The desktop shortcut (the part you download) is a small HTML file containing an iframes link to this site - where the main search page is located. In this respect it is no different to any other webpage on the net. If any difficulties arise as a result of this download, or subsequent use of Equator Internet Search Page, please understand gjstories.net and/or persons associated with this website are in no way liable or responsible for damages. If you have received Equator Internet Search Page via email, or some other digital method, first re-download an original version. In respect of the above points, or other technical matters, gjstories.net is unable to offer assistance of any sort. first make sure your browser is set to work with iframes. To use Equator Internet Search - Right click, save as, save in "Desktop"